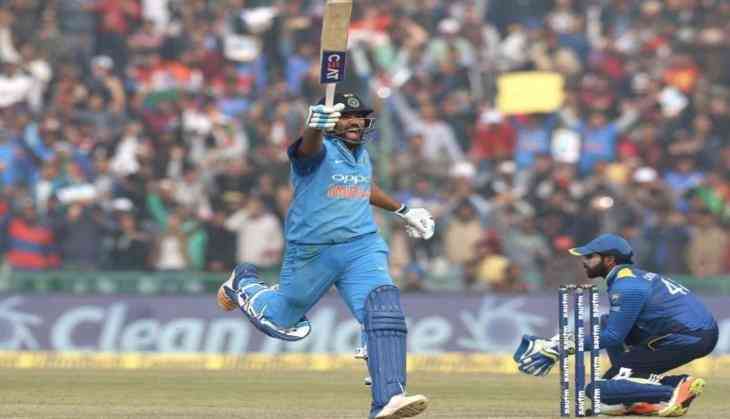 In the second ODI in Mohali's Punjab Cricket Association stadium against Sri Lanka, Rohit Sharma played a brilliant innings. Rohit, who took over the captaincy in the absence of Virat Kohli, put 208 runs in 153 balls. During this time his strike rate was 135.94. In his innings, he scored 13 boundaries and 12 sixes. This is the third time when Rohit has scored a double hundred in ODI cricket. Interestingly, today is the second wedding anniversary of Rohit Sharma. Rohit Sharma for the first time in the year 2013 scored his double hundred against Australia. This match was played on 2nd November at the M Chinnaswamy Stadium in Bangalore, Rohit scored 209 runs in just 158 balls with 13 fours and 16 sixes. During this period his strike rate was 132.28. In this match India had scored 383 runs losing 6 wickets. In reply, the Kangaroo team was stacked on 326 runs. After this, when the Sri Lankan team came to India in 2014, Rohit Sharma in Kolkata's Eden Gardens scored 264 runs in 173 balls, making the world record. This record is still unreliable. In this innings, Rohit had scored 33 fours and 9 sixes, that too with a strike rate of 152.60. Rohit's blistering inning helped India to set a target of 405 for 5 wickets, in reply Sri Lanka's team could only manage 251 runs in 43.1 overs. Before Rohit, India's Master Blaster Sachin Tendulkar and former opener Virender Sehwag have scored double centuries. Apart from these three, Chris Gayle and Martin Guptill have also done a double century in ODIs.